Priyanka, who is the eastern Uttar Pradesh in-charge of Congress, tried to reach out to voters urging them to bring a government that works for them. 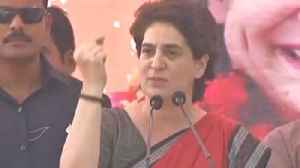 Congress General Secretary Priyanka Gandhi Vadra, who is on a three-day tour of Uttar Pradesh, will conclude her campaign in the state with a visit to Faizabad today.She reached Ayodhya today. Priyanka..
Will Congress field Priyanka from Varanasi?